"Rest In Peace Whitney Houston & Sing With The Angels. We will always love you. You will be missed." This is my Tribute Piece to Whitney Houston. Let's all keep her family, especially her daughter Bobbi Kristina Brown in our prayers. I pray that this image gives peace and healing to all who love Whitney Houston. THEN CLICK ON THE IMAGE IN THE NEW WINDOW TO BRING TO FULL SIZE. I don't own the copyright to the two images that I used to create this Tribute Piece. I am not sure when or where I got the images so if you own either image please contact me so that I can link back to you with the image credit. In creating this image out of my love for Whitney Houston from the vision that God gave to me, I am not claiming any copyright or profiting from the creation of this image. No harm to the image copyright owners was intended in any way. This image is given freely. Feel free to share this image. No one is authorized to use this image titled "Tribute to Whitney" for commercial gain. This image can only be printed to be given freely and is not to be sold by anyone. The above link takes you to a high resolution JPEG file. 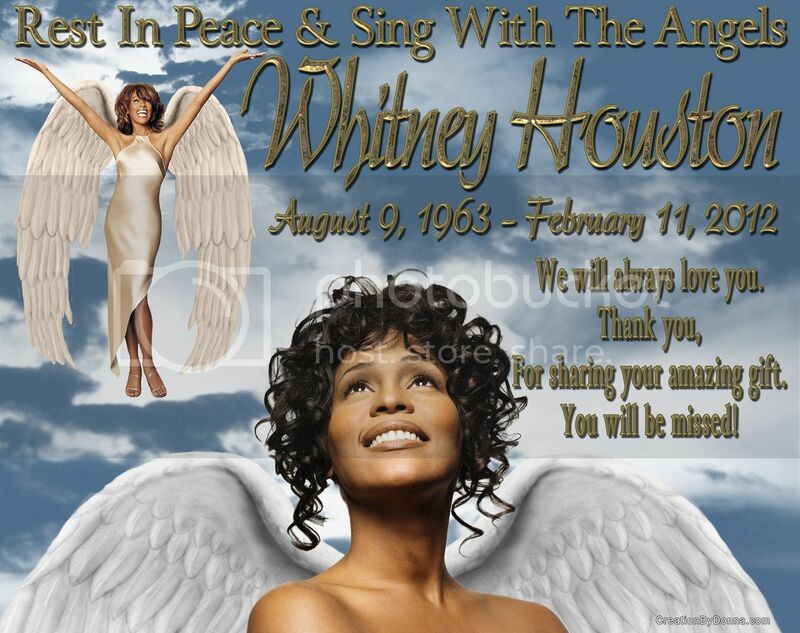 If you need a PDF file for printing send your request to info@creationbydonna.com Subject: WHITNEY TRIBUTE and the Print Ready PDF file will be sent to your e-mail.